Communications minister Dina Pule has lashed out in a scathing letter at the SABC board for the suspension of the corporation’s controversial chief financial officer Gugu Duda, the appointment of her replacement, and the reinstatement of acting chief operating officer Hlaudi Motsoeneng, which she described as “unprocedural”. Duda, a chartered accountant who was on a five-year contract at the SABC until she was suspended by the board, is being investigated for allegations of financial irregularities and has been suspended on full pay. Pule expressed her unhappiness in the letter addressed to SABC board chairman Ben Ngubane. The letter was sent after the unexpected resignation of both Ngubane and his deputy Thami ka Plaatjie earlier this month. The board is in limbo as it waits for President Jacob Zuma, who appointed them to their posts, to consider whether he would accept their resignations. Amid the mayhem that was provoked by the board’s recent decision to remove Motsoeneng from his post, the minister’s letter has infuriated some board members. But Motsoeneng, the man at the centre of the imbroglio, never budged from his office and has remained in his post. Duda was considered to be the minister’s choice as chief financial officer by some board members, because Pule had rejected others on the short list until Duda’s name was added. A board member who did not want to be identified said that it was “outrageous” that Pule appeared to be trying to protect Duda. Pule has the final say in the appointment of SABC executive directors recommended by the board, but she is not expected to interfere with disciplinary processes or suspensions at the public broadcaster, a board member told the Mail & Guardian. Only if a recommendation is made for an executive director to be fired will the board members ask the communications minister to approve the action. Pule’s spokesman, Siya Qoza, said he had heard the minister’s letter had been misinterpreted, which he considered “mischievous”. The M&G has a copy of the letter, dated 6 March, in which Pule explained she was concerned about the “inconsistencies” she was experiencing from the board. In her correspondence, Pule outlined the bizarre turn of events that rocked the SABC board in the past two weeks and explained why she could not accede to two requests from it. The first request was a letter signed by Ka Plaatjie. It outlined to Pule the “resolution taken by the board in respect of the current acting chief operating officer”. The letter to her had indicated that at the special SABC board meeting, the board resolved that Motsoeneng will return to his position as general executive of provinces, with immediate effect. It also indicated that Mike Siluma would be appointed acting chief operations officer with immediate effect. The second request was again a letter signed by Ka Plaatjie, this time indicating the withdrawal of the decision to remove Motsoeneng from his post, she wrote. “In November 2011, you requested me to authorise his [Motsoeneng’s] delegation of duties which I did, therefore I appreciate the fact that it is not a statutory requirement, but the board informed me as the shareholder of both these decisions,” wrote Pule. “However, my concern is the inconsistencies I am experiencing from the board. But a board member said the suspension of Duda and the removal of Motsoeneng from his acting post were two separate matters. At the time of Duda’s suspension, board member Lumko Mtimde told the SABC the board’s decision was a precautionary measure. “It arises following receipt of reports from forensic people, which led to the suspension of the head of procurement and, unfortunately, in terms of that report, there are conclusions that implicate the chief financial officer,” said Mtimde. Pule has previously come under fire over claims that her boyfriend received a multimillion-rand pay cheque in management fees for an information and communications technology indaba in Cape Town. 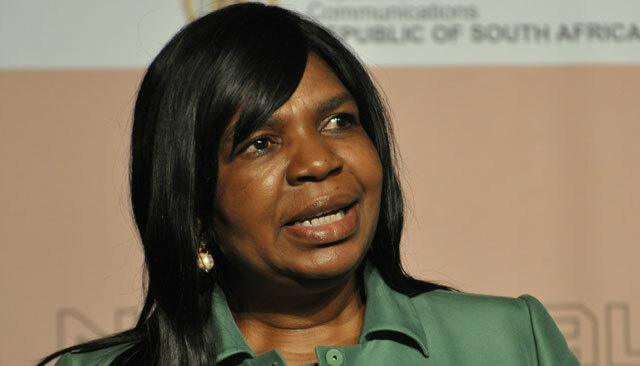 The public protector, Thuli Madonsela, is investigating whether the minister’s department had pressured the organisers of the conference in June last year to hire Phosane Mngqibisa. Pule has told those around her that the investigation will exonerate her. Motsoeneng, meanwhile, has remained in his office. An SABC staff member told the M&G that Motsoeneng also received a letter from Ka Plaatjie telling him he could remain in the acting post, only days after he was removed.